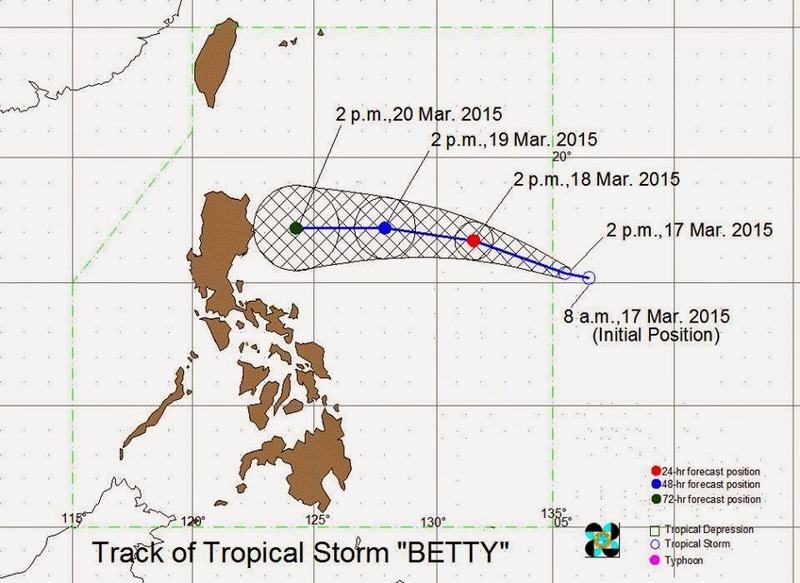 View latest updates for tropical storm Betty (Bavi) from weather central. MANILA, Philippines - 'Bagyong' Betty (international name Bavi) has entered the Philippine Area of Responsibility (PAR), state weather bureau PAGASA officially announced Tuesday night, March 17, 2015. 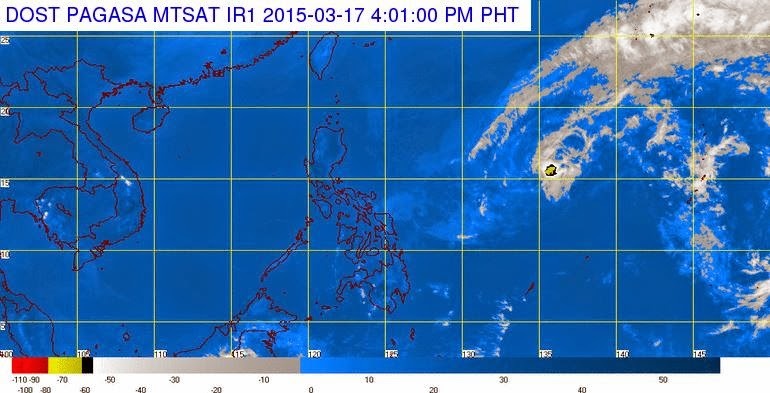 At 5:00pm today, PAGASA said that ridge of High Pressure Area (HPA) is affecting Northern Luzon. Meanwhile at 4:00 PM, the Tropical Storm Betty was estimated based on all available data at 1,435 km East of Casiguran, Aurora (15.5°N, 135.5°E), with maximum winds of 65 kph near the center and gustiness of up to 80 kph. It is forecast to move West NorthWest at 17 kph. The Tropical Storm Betty is expected to weaken into a Tropical Depression within the next 24-36 hours. The whole country will experience partly cloudy to at times cloudy skies with isolated rainshowers or thunderstorms. Moderate to strong winds blowing from the Northeast to East will prevail over eastern Luzon. The coastal waters along these area will be moderate to rough. Elsewhere, winds will be light to moderate blowing from the Northeast with slight to moderate seas.